After posting the picture of some Pennsylvania rocks yesterday, I felt like a sort of disclaimer was in order. Not all of the rocky Pennsylvania section requires the skill that is exhibited here by my long-time friend and hiking partner, Alton. After all, if an almost 60 year old, graybeard, with a walking stick rather than poles, and a brace attached to his knee can negotiate these rocks unscathed, then most others should be able to do so as well. When we hiked this section back in 2008, neither of us had any misfortunes that I can recall. In reality there are some beautiful rock-free stretches of trail in the Keystone state. The section from the PA/MD border to Boiling Sprints affords some picturesque level stretches with a couple of picnic areas to walk through. Other than the Bear Rocks and the climb out of Lehigh Gap, with some exposed rock face at the top, much of the state is quite nice. Then again, when you hike with a positive attitude and are willing to accept the challenges of the trail along with its beauty, your accomplishments should supersede the travails. Most any day can be a great day on the Appalachian Trail. Thanks for all the hiking adventures we’ve shared, good buddy. For many, the word “trail” conjures up a picture of a flat, peaceful path, winding aimlessly through a picturesque backdrop of blooming posies. Or it may bring to mind a straight, rutted country road leading to the home of someone’s grandmother. 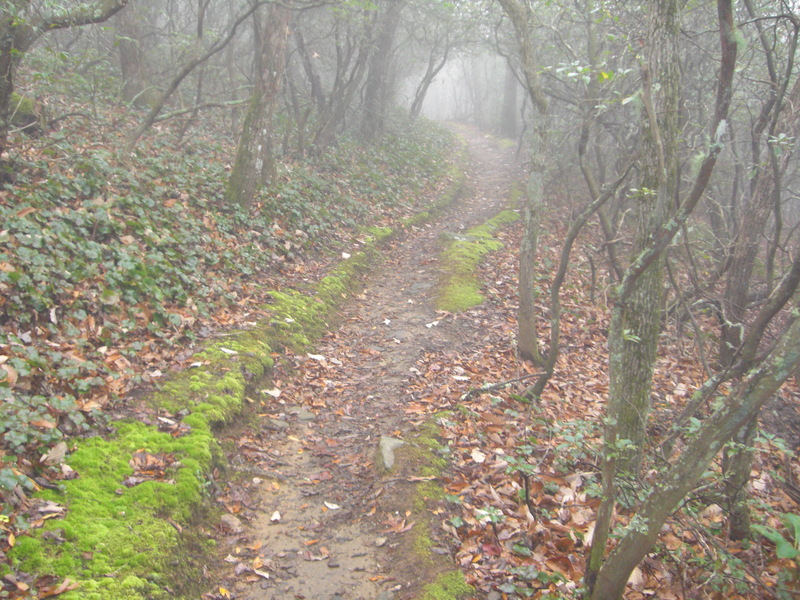 Or then again, the word “trail” may evoke an image of a lengthy dirt lane snaking through the countryside. Whatever the image, the “trail” in our heads is more often than not much different from the Appalachian Trail. So when you tell someone that you’re going to hike the Appalachian Trail, they often think that you are merely going for a long walk through the woods. Still, most of those who enjoy the outdoors would like to have the opportunity to hike along a scenic trail. What many who have never seen the trail believe, however, is that even though the terrain may prove challenging at times, really, after all, it’s just a trail. Yes, at times it is just a trail. At others, however, it’s much more. You see, there are a lot of rocks on the Appalachian Trail. And when I say rocks, I don’t mean the kind you pick up to skim across a lake. Sure, there are some like those. But there are also sharp, jagged rocks, and trash can size rocks, and compact car size boulders. Some you have to climb over using your hands; some are knives edges, with drop-offs on either side of sometimes several hundred feet. You can slip on a wet rock and take a tumble or worse. Sometimes a strategic approach, for which rocks to step on in order to advance from point A to point B, is necessary. In fact, one state in particular is so noted for its rocks that it has earned the nickname Rocksylvania. While some rocks do prove challenging to navigate over or around, some may actually help you with your hike. There are stepping stone rocks over streams. There are also staircase rocks that make certain portions of the trail easier to negotiate. There are even occasionally chair-like rocks, jutting out of a mountain, that appear just when you need a place to rest. Rocks on the Appalachian Trail may indeed become my enemy; however, as I hike the trail I’m going to try to befriend them. After all, why should we view them as adversaries when we will have to encounter them daily? Would you rather consider the rocks obstacles that hinder your advancement to Maine or as companions that quite often offer you a more direct route? Rocks perhaps at times will complicate my movement, but at others they may afford me one of those views that previously I’ve only seen in pictures. Many a day, a rock has been a place to sit to enjoy a scenic vista and a peaceful interlude. The more we come to accept our daily duels with rocks, the more we will appreciate our walk along the Appalachian Trail. As I plan and prepare for my attempt at a 2013 thru hike of the Appalachian Trail, I am reminded of Alfred, Lord Tennyson’s poem, “Ulysses.” After having been away from his wife and son for twenty years, the now graybeard Ulysses has finally returned home. Having experienced a plethora of adventures during those two decades, Ulysses quickly grows restless. He remembers fighting with his comrades on the hills of Troy as well as events that occurred during the return voyage. And as he remembers, he longs for new adventure. Despite being reunited with a faithful wife, Penelope, he realizes that his life can never again be confined to his home of Ithaca. After all, neither his now grown son, Telemachus, nor the citizens of the city he once ruled, really knows him. I believe that for all of those “over 60” would-be thru hikers of the Appalachian Trail that Tennyson’s words ring true. Like Ulysses, we are perhaps seeking a “newer world,” a world for some free of obligations and stress; for others a world free of loneliness or boredom. The “retired” hiker wants to replace the perhaps daily feeling of “wondering what he is going to do” with wonderment. He wants to breathe deeply from the mountain air; he wants purpose again in his life. And like Ulysses, the older thru hiker is seeking. He still seeks meaning in a life that may have only a decade or two remaining. The youthful hiker, however, may be attempting to make some sense of a post college existence. He may be escaping from the rigors of a classroom to a carefree, solitary jaunt through the woods prior to settling into the routines of responsibility. And he hopes that what he learns on this pre-full time employment peregrination will sustain him in the years to come. He may flaunt his youth as he bounces over tough terrain, but simultaneously he will appreciate the less agile footfalls of the aging hiker. And as the miles and days go by, each will view the other with respect and admiration as they walk together toward Katahdin. The Appalachian Trail can toughen you or break you. It can offer you solace and contentment; it can bring you to your knees with frustration and pain. Ulysses knew frustration as he tried to navigate his way back home, but he also knew solace as he found moments to rest under the stars. Like so many aspects of life, we too are engaged in an odyssey of sorts. We expect to confront obstacles that may force us to take a detour on the road of life. We also hope for a path that will provide us perspective and direction. Whatever the reason for hiking, all are pilgrims together on the Appalachian Trail. After my recent hike beginning at Unicoi Gap, I decided that a trip to Neel’s Gap was also in order. Neel’s Gap is where the fabled Mountain Crossings at Walasi Yi is located. Even though I had visited the historical site on three other occasions, this was to be the first time I would arrive with a filled pack ready to be evaluated. Much to my good fortune, it was Winton Porter who asked if he could help me with my search for hiking gear. After explaining to him that I was planning to attempt a thru-hike in the spring, and that I would need several new pieces of gear, Winton was gracious enough to devote well over two hours of helpful advice. Our conversation primarily centered on my selection of a light weight sleeping bag and pack; however, Winton also advised me on shoes, hiking poles, a stove, and a few other essential items. In addition to my gear education, we also discussed running, an interest that I discovered Winton shares with me. Amid the hiking discussion, the running discussion, and the gear discussion, time zoomed by. Not really wanting to purchase either the pack or sleeping bag without doing a bit more research, I finally declared to Winton that since I had taken so much of his time that I felt obligated to buy something. He suggested an autographed copy of his award winning book, Just Passin’ Thru. Even though I appreciated Winton’s suggestion, I still felt like a more substantial order was warranted. Since the hiking poles I have been using are both cheap and in poor condition, I purchased a pair of Leki corklite poles for my upcoming thru-hike attempt. These should suit me well. Before leaving Mountain Crossings I chatted briefly with another employee, George, a thru-hiker from 2009. Three south bounders, who were planning to complete their venture in the next two days, were also relaxing out front. As the afternoon waned, I wondered how I would feel with only two days remaining of a five month adventure. Like so many, I look forward to passing through the stone arch as I walk toward Maine next March. If you’re within a few hours’ drive of the famous structure at Neel’s Gap, I would recommend a visit prior to your hike. Winton and all of his employees possess a wealth of hiking knowledge that they will gladly share with all who ask. And by the way, I did pick up a copy of Winton’s book. It has proved to be both enlightening and entertaining. I would call it a must read for anyone contemplating a thru-hike on the Appalachian Trail. Late last week I had the opportunity to drive up to the North Georgia Mountains for a couple of days. While there I decided to do a day hike on the Appalachian Trail. Since I viewed the hike as somewhat of a practice venture, I decided that a practice journal entry for the hike would also be appropriate. Even though most of my journal entries while on the trail will be from my phone, this one is being typed at my computer in the comfort of my home. I’ll wait until later to practice writing a journal entry in a tent, with freezing temperatures, snuggled into a sleeping bag, using my phone. At this time there’s no point braving the elements to record the adventure. Every hike has the possibility of being an adventure. On the Appalachian Trail is seems like daily adventures collectively become one major adventure. When I set out at Unicoi Gap for what I planned to be a 7.2 mile out and back hike to the Cheese Factory camping site, I anticipated a solitary, less than eventful morning. For about 90 per cent of the hike, I was correct. But I’m getting ahead of myself, so let me get back to the beginning of the day. After arriving in Helen, Georgia, a Bavarian themed village of sorts about 10 miles from Unicoi Gap (at the 50.9 mile mark of the trail), I checked in at a local motel. Since it was approaching sundown, I decided to wait until the next morning to visit the AT. Having already section hiked all of Georgia, I merely wanted to re-acclimate myself to the rigors of the trail. I purposefully left my sleeping bag at home so that I would not be tempted to spend a cold night in the woods. After all, the motel offered a blazing fire in the lobby, coffee and cider, and the chance to listen to a group of dulcimer players who were in town for a yearly convention. Well getting back to the trail, I awakened just before 6:00 with the intention of starting my hike at 7:00. When I noticed that it was still very dark and a cold mist covered the mountains, 7:30 and daylight began to sound better for a starting time. So I leisurely enjoyed my waffle, sausage, and coffee, from the motel’s complimentary buffet, before driving up to Unicoi Gap. Several of the dulcimer folks were dining as well. Although I thought about engaging one of the couples in a conversation regarding an instrument whose sound has always fascinated me, instead I tried to stay focused on the ensuing hike. In my car, I navigated the winding road up the side of the mountain toward the gap, arriving at about 7:15. The day was cold and foggy, but the light rain had subsided. When I took my first step on the trail, headed northward, my watch showed that it was 7:25. Although visibility was only fair for the first hour, I made good time reaching the top of Rocky Mountain. I purposefully chose this section for my “practice” hike since there was over a 1000 foot accent during the first 1.3 miles. Since I hadn’t hiked any on the trail in over three years, I wanted a challenge from the beginning. Not really remembering the first time I was at this section very well, the climb seemed a little less difficult than I had expected. There were an abundant number of switchbacks and rock staircases in places as well. With any hike on wet rocks, however, I always worry about slipping. Fortunately I only slipped a couple of times and was able to cover the entire distance without falling. After reaching the crest of Rocky Mountain, the hike meandered briefly before a descent began toward Indian Grave Gap. There was another less severe climb toward Tray Mountain Rd. just before I arrived at my turnaround point, the Cheese Factory Site. Most of the foliage in the area had dissipated, but the ground cover of varying shades of yellow, red, and orange leaves afforded a beautiful backdrop for a brief respite and a sip of water. Since I hoped to conclude the hike around 10:30, I quickly re-shouldered my daypack and started back toward Unicoi Gap and my car. Up until this point I had neither seen nor heard any other living creature on the trail. As I began the return trip, sunlight filtered through the few remaining leaves. I paused for another short break at the only vista on this short section and snapped a few pictures of the fog covered mountains in the distance. Peacefulness abounded as I steadily hiked back up the north side of Rocky Mountain to its apex. After another brief rest for water, I started back down the now 1000 foot descent. It was just a very nice day, but what was about to happen would make it even nicer. Just to my left, about 20 yards in front of me, a rather large black bear came bounding down the mountainside. After crossing the trail, he stopped and looked in my direction. For what could have only been two or three seconds, we stared into each other’s eyes. With what I’ve come to regard as due respect in nature, the bear and I silently connected. Then just as quickly as he had appeared, the bear jogged westward down a slope. When he stopped again, I was able to zoom in for a picture. Although he is at a distance in the photo, I know it’s a bear. As I kept walking, I looked over my shoulder a couple of times to make sure he hadn’t changed directions toward me. So after seeing no people or wildlife for over six miles, I had the good fortune to have a close encounter with a bear on my first hike on the AT in over three years. The bear sighting made my hike complete. The last mile downhill on Rocky Mountain required a little more diligence than the uphill climb a couple of hours earlier. Still I made it back to my car by 10:35. For my first experimental hike, I had covered 7.2 miles with two fairly challenging ascents in just over three hours. Despite the early morning chill, the foggy conditions, and the lack of companionship, my short day hike of mid-November proved to once again be a very good day on the Appalachian Trail. Having already hiked over 1000 miles of the Appalachian Trail is a definite advantage for someone planning a thru hike. Having already hiked over 1000 miles of the Appalachian Trail may prove to be a disadvantage for someone planning a thru hike. Knowing just what awaits around the next bend or up over the next ridge may bring a smile to one’s face and a pleasant memory to the mind. Knowing just what awaits around the next bend or up over the next ridge may evoke an emptiness in one’s stomach, a soreness in some body part, a reminder of the agony felt at this same place, another time…on another hike. But isn’t that what life is like. Just when everything is moving along comfortably, we hit a bump in the road. In our memories we constantly revisit the past, sometimes wanting to repeat those wonderful events from long ago. More often than not we forget, or block out the memory of, the less than desirable occurrences that may have come before, or after, or even paralleled the good times. Still, we reminisce, we long for; we might even yearn for bygone days when we were stronger, thinner, more flexible, faster….youth. And so it goes on the Appalachian Trail. You awaken one morning early in the hike to sunshine. Despite the fatigue in your muscles and the blister on your heal, you break camp with enthusiasm, eagerly anticipating the climb up the next mountain. The walk goes smoothly along the pine straw covered path. Birds chirp; the sunlight filters through the budding hardwoods; the crisp early spring morning is invigorating. You are hiking the AT. Then the climb begins. The sun gets higher and warmer. Sweat beads up on your forehead. You remember the blister and the soreness in your shoulders returns. You pause and look up to what seems an insurmountable task, reaching the summit of yet another mountain. You realize that you’re still in Georgia. There are 13 more states to follow and many mountains to crest. Still you walk. You reach the top; you admire the view; you try to think of a better word than “breathtaking” to describe what you see. You rest, and then you move on until the end of another day, a good day, on the Appalachian Trail. As I hope to accomplish the task of completing a thru hike of the AT in 2013, I plan to approach the trail in 4 sections, 2 that I have already completed and 2 that I haven’t. Although not all at one time, I have already hiked from Springer to the Nantahala Outdoor Center near Wesser. This will serve as my section one. From Nantahala to Rockfish Gap, a part of the trail that I have not hiked, other than briefly around McAfee Knob, will constitute section 2. From Rockfish Gap to Hanover, NH, again trail that I have already traversed, will be section 3. Finally from Hanover to Katahdin, another section that I have not hiked, except the brief section in the Whites, will be section four. Will I make it to Katahdin? I don’t know whether I will or not. What I do know is that I’ll give it my best shot. Maybe around the next bend a fall will await; maybe I’ll sprain an ankle, or twist a knee. Or maybe around the next bend, there will be a doe in my path with a new born fawn at her side. There may very well be both somewhere between Georgia and Maine. Either way, I’ll need to move on. Because as long as I’m moving, I’m still on my quest, hiking toward my destination or perhaps my destiny. When you do something poorly the first time, you sometimes want to try it again. As the next school year began I couldn’t help but recall how we had been planning our hike in the White Mountains this time last year. Even though the memories of the Whites were still fresh in my mind, I felt this desire, almost need, to get back out there. A former student and athlete, who I had coached in cross-country, had thru hiked in 2000. After listening to (trail name Jeremiah Johnson) talk about the trail to one of my classes, I knew that I had to give the AT another try. He spoke of covering the entire 42 mile stretch of Maryland in one day as some sort of challenge. As a distance runner, this seemed like something I could do. After all, I had read that Maryland was the easiest (not a term that really ever applies to the AT) state. So without hesitation I approached my buddies about hiking Maryland as soon as the ’01-’02 school year concluded. This time it was I, not Alton, who did most of the planning. For the entire fall I spent time convincing the others that we needed to give hiking one more try. So in late May of 2002, five of us (Fitts’ truck broke down before we left GA) set out in two SUV’s for Harper’s Ferry, WV. I had even arranged for a stay in a real AT hostel (Sandy Hook) the night before we were to begin our southbound trek from Pen Mar Park at the PA/Maryland border. Like the previous year in the Whites, that first day was an ordeal despite the “easier” terrain. After a night at a shelter some 9 miles in, Doc, Reg, and Lindsey decided that hiking definitely was not for them. They hitched a ride back to the vehicle and opted for a tour of Gettysburg. Alton and I trudged on, determined to complete the entire 42 miles, even though we had already decided that this was a three day hike, not a one or two day one. Our buddies, before deserting us, did offer to carry some of our gear to the Dahlgren campsite, where we planned to set up our tent (yep, still the 4 man one) the second night. We didn’t know what slackpacking meant at that time; however, over the years, “slackpacking” has become one my favorite hiking terms. Day three took us into Harper’s Ferry and to the end of that year’s hiking adventure. Since Maryland was complete, over the next few years, Alton and I continued the section hiking, knocking off a state here and a state there. 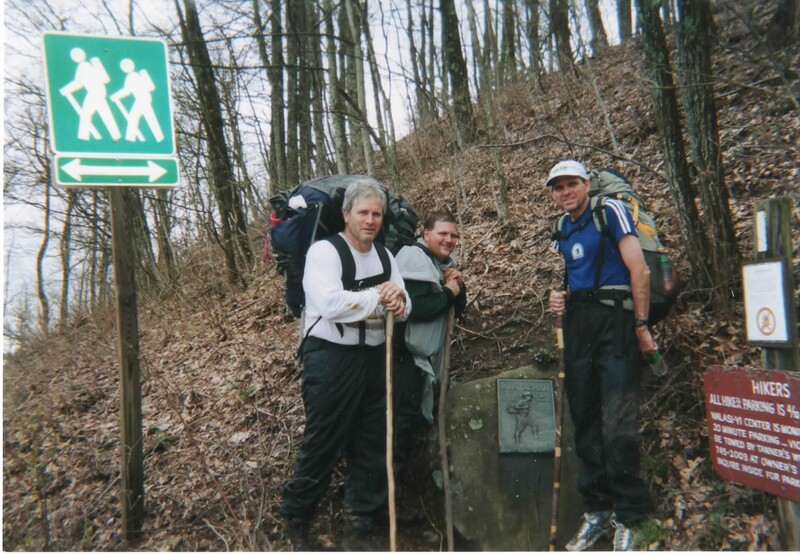 Fitts even joined us for the section from Springer to Neel’s Gap during spring break, 2003. Alton has completed more sections than I have and has promised to complete his section hike with me in Maine, if I make it that far. That would be pretty special—Alton completing the AT section hiking at the same time I completed a thru hike, on Katahdin together. If nothing else, it should make for some interesting journaling over that last 300 miles. In the fall of 2000, a fellow teaching buddy, Alton, decided that he and some of his friends (myself included) should begin taking some “adventure trips.” Since most of us were about to turn 50, or just had, Alton thought that a backpacking trip in the late spring of 2001 was just what we needed. For this first trip he chose as our destination some place up in New England called the White Mountains. I had heard of the Rockies, the Smokies, the Adirondacks, and even the Green Mountains of Vermont, but quite honestly, I didn’t know much about the Whites. For the next several months Alton meticulously outlined details for our excursion. After weeks of reading a variety of informative “what to and how to” literature, he provided each member of the backpacking group with folders containing an itinerary, maps, a list of supplies needed, and a discourse on the much dreaded black fly of New Hampshire. Doc, Reg, Alton and I (the already or about to be 50 year olds) and Fitts and Lindsey (20 something’s) eagerly (yeah, right) awaited the end of the school year and our trek up to the northeast. The flight from Atlanta to Boston and the subsequent van journey to Lincoln, NH proved uneventful. The next morning, we set out near Franconia Notch with great enthusiasm. Our first day goal was about a 12 mile hike that would culminate at the Guyout campsite off the AT. We made it to our destination, but along the way we learned much about backpacking like…..it’s not a good idea to bungee gear to your pack, don’t plan to camp at a site .7 miles off the trail, taking turns carrying the two 4 man tents does not diminish the weight of the tents, check to find out if fires are allowed before purchasing steaks to pack in to cook over campfires, and lastly, visit a physician before beginning the hike if you’re 50, slightly overweight, and have never hiked in the Whites (Reg). Alton and I, who were the only two of the group really in shape, were the first to arrive at the campsite. We were greeted by a young female caretaker who gazed on our appearances with what might have been considered utter amazement that we were still standing. I still remember declaring to this young lady that this was our first backpacking trip and that it was about to be the first night I had ever spent in a tent. And I unabashedly added, “And I just turned 50 two weeks ago.” She was not impressed. When she asked, “Why did you choose the Whites,” neither of us could think of a good reason. About two hours later, shortly after dark, the rest of the gang arrived, and they were a pitiful looking bunch. The caretaker graciously offered to boil us some water for our MRE’s after telling us that campfires were not permitted. After our meals, we settled in to our tents. Alton, Fitts, and I shared one; Doc, Reg and Lindsey the other. I slept very poorly that “first night in a tent.” If I had brought a sleeping bag, it might have been better. After a night at the 13 Falls campsite, on a trail off the AT, we finally made it back to Lincoln. For days, every time I closed my eyes I saw giant rocks. This was one adventure that I would never attempt again. I was a runner, not a hiker. I didn’t even like camping or sleeping in a tent. This would definitely be my last backpacking trip. But alas, it wasn’t. Over the next twelve years since that first taste of the AT, I would section hike over 1000 miles of the trail and now actually own a sleeping bag. So, twelve years later, I plan to arrive at Springer in March, a little older, and much more knowledgeable about backpacking, to attempt (and I do say attempt) a thru hike. My goal is obviously to reach Katahdin, but along the way I have some other goals I hope to achieve as well. One of those goals is to record a daily entry into my journal, detailing as accurately as possible what it’s like out on the trail. Other goals I’ll share in future prep entries and as I hike. Among other things, I’m looking for an adventure. And I think the AT just might provide one for me.